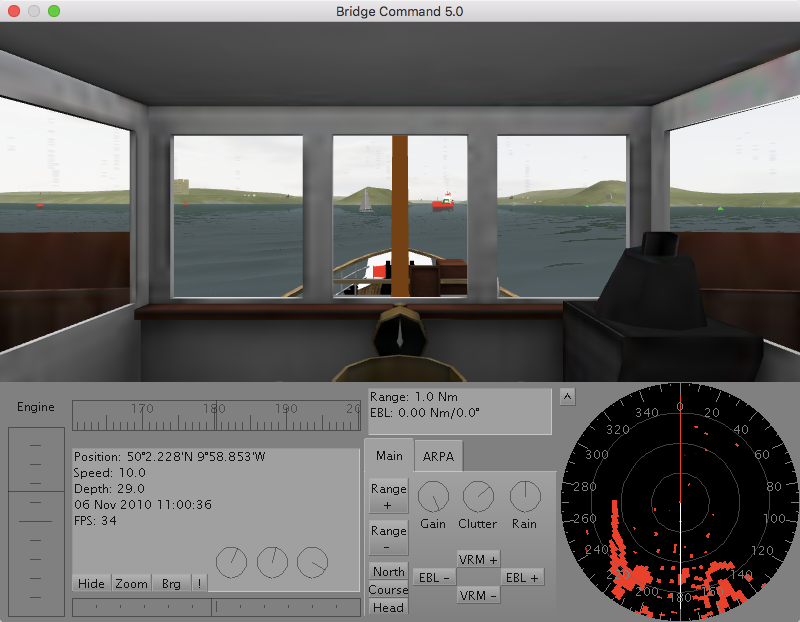 Bridge Command is a free interactive ship simulator program for Windows, Apple OSX and Linux. Its aim is to be a training tool for navigation, radar, ship handling, and other seamanship skills. Bridge Command released under the General Public Licence v2, and is available for commercial and non-commercial use. Bridge Command is very highly flexible, with the environmental model, ships, buoys, individual scenarios and almost all aspects of the simulation being configurable to your own needs. Bridge Command can be run on a single computer, with no additional devices needed. It can also be run with physical controls, and has an interface where a trainer can control scenarios in order to carry out training exercises, from a second computer. It can display on a single screen, or can display a full panoramic view across multiple screens using multiple computers. The radar picture is simulated in real-time, and includes standard marine radar controls such as gain and clutter, as well as features such as parallel indexes and ARPA contact tracking. Bridge Command can be downloaded from the download page. Bridge Command is distributed under the terms of the General Public Licence, version 2. Bridge Command is distributed with ship models, which their authors have kindly permitted to be used with Bridge Command. These may not be used for other purposes without the prior permission of their respective authors, and are not distributed under the General Public Licence. Bridge Command is written in C++ with the Irrlicht engine, and runs on Windows, OSX and Linux. Bridge Command 5.0 is the first version where this is possible, and will be the start of a new phase of development. It is a complete re-write of the program, and therefore there are some differences, although compatibility has been maintained as much as possible. Bridge Command is under continual development, and feedback from users is very important in ensuring that Bridge Command develops to be the most powerful and usable possible. Feedback and feature suggestions are warmly encouraged, either through the forum or the contact page. Bridge Command 4.7 is still available for Windows only, and was programmed using the Blitz3D language. Blitz3D is now available free and with an open source licence - please see the Blitz forum for details.